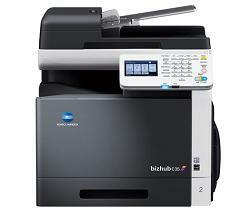 Print, copy, scan and fax at speeds up to 31 ppm using the Konica Minolta bizhub C35. This color multifunction laser printer features a compact footprint, sleek styling and a monthly output up to 120,000 pages. Robust features such as the Emperon Print System, Universal Printer Drivers and PageScope Software make interfacing the bizhub C35 with your existing network simple. Fast print, copy, scan and G3 fax output at speeds up to 31 ppm in color and B&W. Attractive functional styling with InfoLine status display and a bright 4.3" color touch-panel. Flexible scanning, copying and faxing with the ability to scan to Email, FTP, SMB, USB, HDD and network TWAIN scanning. In-house developed Emperon Print System adds PCL6/PS3 and native XPS functionality to your color multifunction laser printer. Simitri HD toner provides better image quality at 600 dpi x 600 dpi and uses fewer resources to save you energy and the environment.